It's Pancake Day here in Ireland today. It's the equivalent of Mardi Gras, since my media professor didn't have a clue what Mardi Gras meant. The news was full of segments showing people eating delicious looking pancakes, talking about delicious looking pancakes, cooking delicious looking pancakes...you get the idea. Unfortunately, I did not have any pancakes today. We had classes today and we have a paper due on Thursday, so we've all been a bit busy and preoccupied. The workload here is much lighter than the work at BU so having two papers due in the next week has thrown us all for a loop. But I, along with everyone else, take comfort in knowing that there has to be someone in the class who has done less than me at this point. Nevertheless, I should start making a dent. I dipped a Cadbury egg in my Barry's tea tonight as a Mardi Gras treat to myself. For those of you keeping score at home, my Cadbury egg count is up to at least one per day. Today was a double. 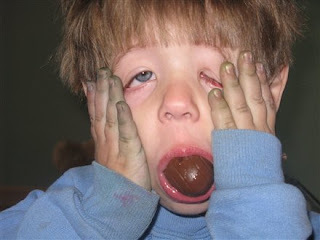 This picture accurately represents my reaction upon looking up the calorie count in one egg. I won't spoil the surprise for you, but it's not pretty. Here's to making the most of your Fat Tuesday! I had pancakes today! I probably had enough for you too.